We have our first sighting of a Christmas Grinch this year. This one is from the American Humanist Association. East Point Academy, a charter elementary school in Cayce, South Carolina has been participating in a program to give toys to needy children for the last three years. They will not be participating this year because the American Humanist Association has decided that it violates the sacred principle of separation of church and state and has threatened to sue the school. Here is the story from WBTW News. An elementary school is canceling a Christmas toy drive they have participated in for three years after a threat of legal action this year, WLTX reported. East Point Academy in Cayce, with 360 students, is a publicly-funded charter school under the South Carolina Public Charter School District. For the past three years, the school has participated in “Operation Christmas Child,” which is affiliated with Samaritan’s Purse. Under the program, kids collect toys, pencils and other small items, pack them into shoe boxes, and donate to needy children. That has now stopped after the school received a letter last Monday from the American Humanist Association, a national nonprofit organization with over 20,000 members and 125,000 supporters across the country, according to the letter. “The letter was very explicit that there would be litigation against us if we did not stop,” school East Point Academy’s principal, Renee Mathews, told WLTX. Mathews said that of the two full years the school has participated, before the practice was stopped with the letter, about 100 families participated each year. The letter came as a shock to her and others at the school because she hasn’t had many issues from the local community. “We have parents that ask questions, but in this case, it’s not really a parent. It’s an outside group,” she said. The letter claimed it was sent on behalf of a parent at the school. It points to the fact that Operation Christmas Child is part of “Samaritan’s Purse,” an international Christian based organization led by Franklin Graham, son of Evangelist Billy Graham. The school’s principal says there are a number of parents who’ve told her they already prepared boxes. She’s encouraging them to donate those items to a charity of their choosing. East Point Academy says they will continue to take part in other Christmas related programs, such as Toys for Tots. So, let’s get this straight. Operation Christmas Child is not an explicitly religious program. There is no proselytizing of any sort. It is not part of any church. The only relation the program has with any religion is that it is part of a Christian charity that specializes in helping relieve victims of disasters and wars. This is unconstitutional? For the record, the first amendment reads. How in the world does giving toys to children count as an establishment of religion or prohibiting the free exercise thereof? Notice that there is no mention of separation of church and state here. That phrase comes from a letter from Thomas Jefferson to the Danbury Baptist Association. Here is the full statement. Believing with you that religion is a matter which lies solely between Man & his God, that he owes account to none other for his faith or his worship, that the legitimate powers of government reach actions only, & not opinions, I contemplate with sovereign reverence that act of the whole American people which declared that their legislature should ‘make no law respecting an establishment of religion, or prohibiting the free exercise thereof,’ thus building a wall of separation between Church and State. Now please note that Jefferson did not propose the concept of separation of church and state because he believed that religion was a pernicious influence that needed to be purged from the public square. He proposed the concept because he did not believe the government should force people to belong support a church or keep them from practicing their religions. I know that I am no constitutional lawyer, but I fail to see how a school giving toys to children, even if it receives public funding equates to forcing people to support a certain religion, especially when the the program only has a tangential relationship to a church. And, even if it did what harm is done here? America is hardly going to be transformed into a theocracy because some children are given toys. 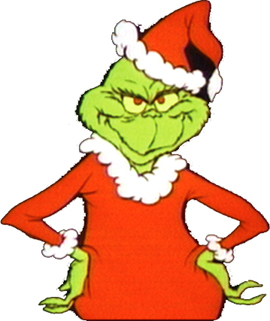 The members of the American Humanist Association are simply being Grinches.